﻿ How to Double The Size of Your Email List in 3 Months, Part 1 » Red Mango Marketing! This probably goes without saying. Whether you’re brand new to email marketing or have been at it for years, you should always be looking for opportunities to grow your email list. It makes sense, right? Bigger email lists mean bigger results for your business. More new customers. Increased sales. New to Constant Contact? Try it out for free with a free 60-day trial. Even if you know list growth is important, you might not know where to start. There are plenty of ways to grow your email list, but some strategies are definitely more effective than others. In this three-part series, I’m going to share with you three list growth techniques that have worked best for me. 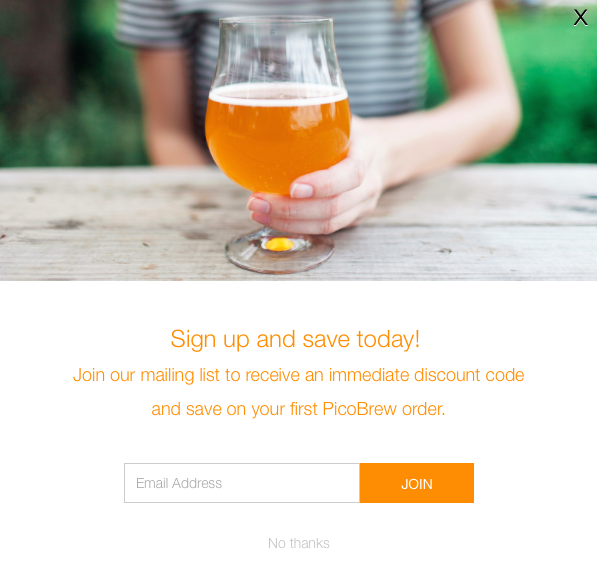 These simple techniques helped me grow an email list from 50K to well over 100K this past fall for PicoBrew, a startup that specializes in automatic beer brewing appliances. Follow this three-step formula and I’m confident you’ll see similarly impressive list growth for your business. Your website probably already provides valuable exposure for your business. Take things to the next level by turning it into a lead generation machine. Even if you’ve already added a sign-up form to your website, adding a pop-up will get you more attention and more signups. At PicoBrew, we saw our average number of daily signups more than triple since we added a pop-up form — increasing from about 30 signups per day to around 100. The best part? Once you set up your pop-up form, it will consistently collect leads for you and add them to your email marketing account without any added effort from you. What if you’re afraid a pop-up will annoy your visitors? 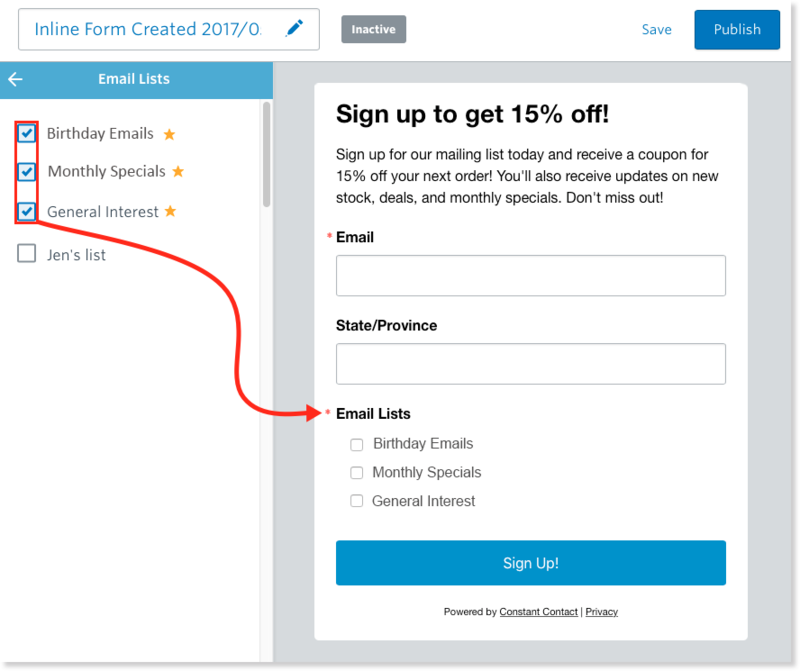 Offer something of value: Don’t use a boring or vague call to action like “Join our email list!” Instead, make the benefit of signing up clear to your visitors. Don’t ask for too much: Only ask for the information you really need. Usually first name and email address is enough. Time it right: You don’t want to interrupt your visitors immediately when they hit your site. Give them a few seconds to settle in. We let visitors know they will receive an immediate discount upon signing up. We customized the form with one of our brand colors, made it easy to fill out, and set it to appear a few seconds after new visitors reach the site. How can you set up a pop-up form for your business? Constant Contact recently made it super easy to create an effective form and add it to your site. 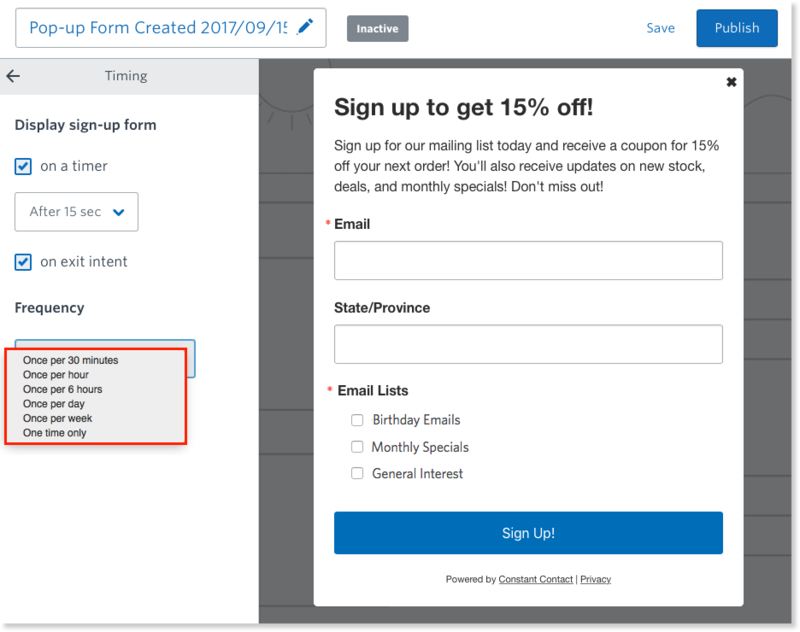 Customize your form’s copy, colors, and contact fields. If you have multiple email lists, you can even make it easy for visitors to only sign up for the information or promotions they’re interested in. Segmenting your email list into different lists will help you better market to your customers. Contact Contact’s advanced features let you dictate the exact timing and frequency of your pop-up form. Put your pop-up on a timer so that visitors will see the pop-up after a certain amount of time. Or use the “exit intent” feature to display the form when someone goes to leave your site or page. Then, select a desired frequency, so that repeat visitors see your pop-up less frequently than someone brand new to your site. A pop up form with the right frequency will help you keep customers signing up, instead of being annoyed. From there, it’s just a matter of copying and pasting your code into the footer of your website. Visit Constant Contact’s Knowledge Base for a full step-by-step look at the process. I’ve just shared one of the fastest and easiest things you can do to grow your list, by collecting information from people who are already interested in your business. Don’t forget to send all new subscribers that all important Welcome Email so you can deliver on any value you promised right away and you start your relationship off on the right foot. Start building your pop-up form, right within your Constant Contact account. 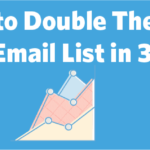 The post How to Double The Size of Your Email List in 3 Months, Part 1 appeared first on Constant Contact Blogs. This entry was posted on Monday, April 2nd, 2018 at 8:00 am	and is filed under Email Marketing, List Growth, News & Updates. You can follow any responses to this entry through the RSS 2.0 feed. Both comments and pings are currently closed.